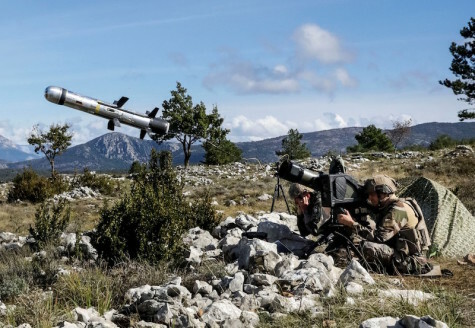 This demonstration – organised on 12th October 2018, at the Canjuers base in the presence of the French Army and the Direction Générale de l'Armement (DGA) – took place in two phases: a dynamic phase, in which representatives from around the world watched three firings conducted by the French Army Technical Section (STAT), and a static phase, based on presentations and workshops making use of standard operational equipment for simulations, training and support. The three firings – all of which struck their targets precisely – showcased the missile’s various operating modes by confronting it with different scenarios, against both fixed and mobile targets at ranges of 2.5 km to over 4 km, proving the accuracy of the MMP in all circumstances, even when fired at hidden targets beyond line of sight. The demonstration, which included firings with the seeker locking on to the target both before and after launch, and using both infrared and TV guidance, also highlighted the MMP's ‘fire and forget’ and ‘operator in the loop’ capabilities. Its ability to engage targets beyond direct line of sight by means of a network-centric enabled tablet computer, or via images relayed by micro-UAVs, was also demonstrated, illustrating how the MMP operates in symbiosis with coordination systems and field sensors. The delegations also discovered different configurations of the MMP: a standard firing post fixed on an Arquus SHERPA Special Forces light combat vehicle; with an Impact remote-controlled turret mounted on an Arquus SHERPA armoured vehicle; and with a T40 gun turret mounted on a Nexter VBCI infantry fighting vehicle. With a significant presence in five European countries and within the USA, in 2017 MBDA achieved a turnover of 3.1 billion euros with an order book of 16.8 billion euros. With more than 90 armed forces customers in the world, MBDA is a world leader in missiles and missile systems. MBDA is jointly held by Airbus (37.5%), BAE Systems (37.5%), and Leonardo (25%).